Any parent can tell you that young children are naturally curious. Little ones love to experiment and explore, and are in a constant state of wonderment about how things work. Learning at this age is rarely formal, but happens organically through experiences. It is an innate part of being human — we want to learn about our world and about each other. But somehow this critical element of our humanity becomes lost when we think of “education.” Formal learning, whether in a homeschool or in a traditional setting, often becomes passive and boring — training kids to memorize information that seems disconnected and entirely removed from their physical world, then perform or regurgitate it on command. Slowly, we forget this most crucial ingredient for true, deep learning — we forget how to be curious. Enki Education was developed by Beth Sutton, M.Ed. in 1991, weaving her own experience and the most effective parts of several different educational philosophies, to provide children with a coherent and fully-integrated program. The driving force behind this educational approach is the belief that “the integration of body, heart, and mind is key to cultivating educational excellence, confidence, and competence.” It uses an experiential approach, guiding kids to find joy in learning through personal discovery. Children are encouraged to investigate through movement, art, manipulatives, discussion, research, experimentation, and activities — nurturing and growing a lifelong love of active learning. Through this process, Enki Education weaves artistic expression, multiculturalism, skill-building, independent learning, concept mastery, and physical activity into a developmentally-appropriate curriculum. In this way, students embark on a journey of discovery, creativity, and improvement. In the early years, in homeschooling, this work is fueled and guided by the parent. But in the Jr. High years Enki feels the children need more independence and more opportunities to learn positive peer interaction. At this point, they offer an innovative, immersive program for older kids in “live online classes”, providing middle schoolers with the tools and structure they need to become contributing and mutually nourishing members of a peer community. 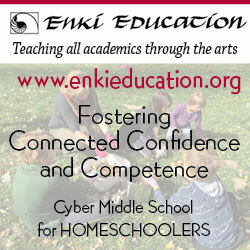 To this end, the Enki Cyber Junior High provides a place for students in grades 6, 7, and 8 to begin exploring their independence and learning how to collaborate with their peers, while continuing to enjoy the benefits of a homeschooling lifestyle (details and samples of student work are found at http://www.enkieducation.org/html/cyber-school-announcement-2.htm). Kids in each of these grades meet in a group with a highly-qualified teacher who serves as a guide on their journey through the unit studied. Every session, students and their teacher login on a secure app that allows them to see one another and share their work. The teacher has a lot of control over the environment, but works to use the platform and online environment as tools that empower the kids as independent learners participating in a peer community. They jointly work on maps to track historical routes, examine famous works of art together, discuss their independent reading, create projects, and much more. On a given day, a class of 12 students per grade logs on at home (through Zoom). They can see and hear each other live, in real time, in their virtual classroom. The teacher has the ability to share her desktop to allow the students to view related information, such as images of works of art, primary source documents, or videos. And both the students and the teacher have access to a virtual whiteboard they can share with one another and work jointly on one undertaking, such as tracing a route of exploration in a historical map the teacher has presented. Importantly, the technology also supports the teacher’s ability to guide the discussion and constantly monitor student progress, ensuring that students are learning and growing, while successfully navigating socially with their peers. The Enki approach to education, combined with the technology goes a long way towards eliminating much of the conflict found in traditional schools. It allows homeschoolers freedom to explore independently, learn to ask for and receive help in a non-confrontational setting, and “virtually” collaborate more effectively than they ever would in a standard physical classroom. To offer a window into these unusual classes, here is a fairly typical session: The students read assigned chapters from a unique Enki Book – amazing and relatable original works of historical fiction. These stories lay the seeds for work with movement art, literature, history, math, and science, all through a multicultural lens. The students then join as a group to continue their learning through exploration of the issues raised in this text in discussion. Sometimes they work as a large group, guided by their teacher, particularly for discussions and for creating the fundamental artistic work that is essential to the Enki approach. However, much of the time the students move into breakout rooms of 2 or 3 students, with frequent visits from the teacher to offer support and direction. While in these breakout rooms, students work on small-group activities, such as Writer’s Workshop. In the Writer’s Workshop, kids bring in their rough draft of a writing exercise that is related to their previous reading. In one recent class session, students studying the Renaissance in Europe wrote Plague Poems that are inspired by the hardships borne from the many characters of the story they have read. The students discussed the style of the poem they wanted to write, then offered constructive criticism, suggestions, and support to their fellow classmates. Afterwards, the kids return to the larger group and debrief about their learning and continue to discuss any challenges or questions that remain. During their next class of the week, students will turn in their final drafts and then read them to one another in the large group. All the while, they are working with art and movement and music to take this learning further. After the first six or seven weeks of the unit, which flow as described above, the last few weeks of the unit center around working in small groups, developing unit-related peer projects. Through these projects students learn more than how to work together — they learn that each person has value and that through their individual contributions they are able to improve, create, and understand more deeply than they ever could alone. And, instead of simply completing projects that seem disconnected and inapplicable to their reality, kids venture on a creative journey to manifest their own relationship to, and interpretation of, the culture, history, and issues worked with earlier in the unit. It is surprising to see how much they can do and how well they can work together online! Samples of these excellent peer projects can be found online (http://www.enkieducation.org/html/cyber-school-project-page.htm). Enki Cyber Junior High will be offering 5 units during the 2018-2019 school year. The Sixth and Seventh graders will work with the theme of independence, learning to trust and explore with their own perception and imagination and reasoning. All this happens through an investigation of Ancient China and the European Renaissance. And Eighth graders will find their own natural “inner revolution” to become independent thinkers reflected in their focus on the revolutions in South Africa (Mandela) and Russia (Ekaterina Breshkovsky). Each of these units is accompanied by an optional, but related, Math and Science Unit. These depend on the Humanities program to fully understand the living context that grounds the abstract math and theoretical science and are detailed on the website (http://www.enkieducation.org/html/cyber-school-notice.htm). Between the two main Units, there is a Grammar Unit, offered for all ages, working with the Tibetan culture and the escape of Lamas during the Chinese occupation. Students can enroll in any unit and examine these topics through the perspective of the Humanities. The Humanities classes meet three times a week in 2-hour sessions for 12 weeks and any student is welcome to join in. The Math and Science class meets twice a week for an hour and half, but is only available for those students taking the corresponding course in Humanities, where the groundwork for the study is laid.